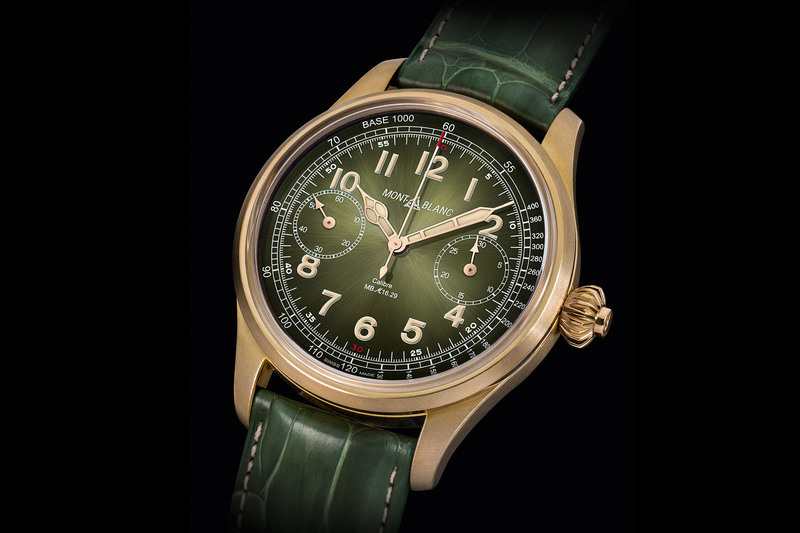 It isn’t the first time that Montblanc surprises us with an original (and of course rather accessible) complicated watch. Indeed, we can easily recall the Orbis Terrarum, which at EUR 5,500 was definitely impressive value for the money (we even compared it to much more expensive pieces here). 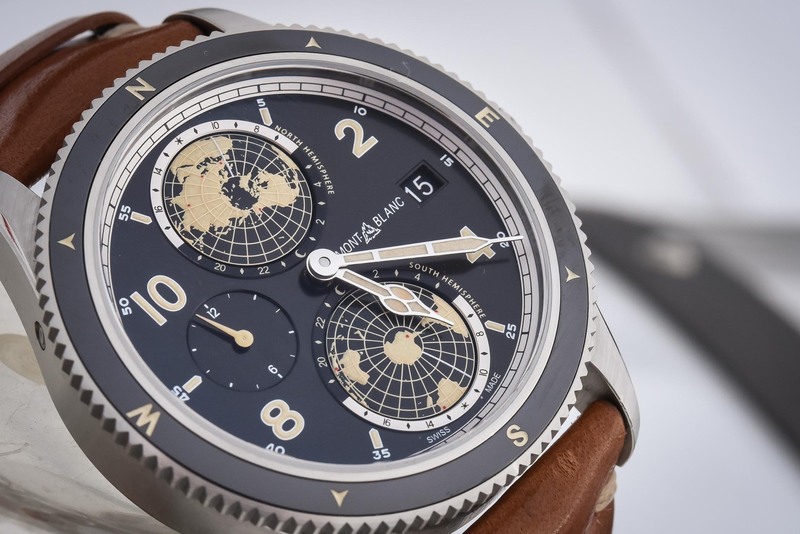 For 2018, Montblanc does it again, with a new Double-Hemisphere, a sporty version of the WorldTime complication, with the original and vintage-inspired 1858 Geosphere… And we have it live, here on MONOCHROME. The name “Geosphere” might sound familiar to some. 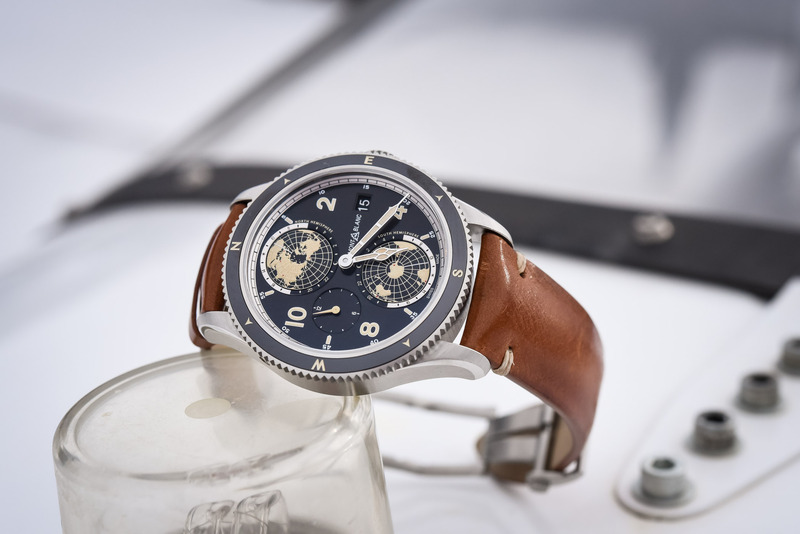 Indeed, this is not the first time that Montblanc has created a watch that displays the WorldTime complication with two turning hemisphere globes. Yet, it was previously seen in the high-end Villeret Tourbillon Cylindrique Geospheres NightSky… A superb and entirely hand-finished watch, with a price tag of EUR 275,000. Bringing the same concept, of course in a much simpler and rationalized way, is the Montblanc 1858 Geosphere, a watch paying tribute to the 160th anniversary of Minerva and featuring a brand-new manufacture WorldTime complication developed internally at Villeret. 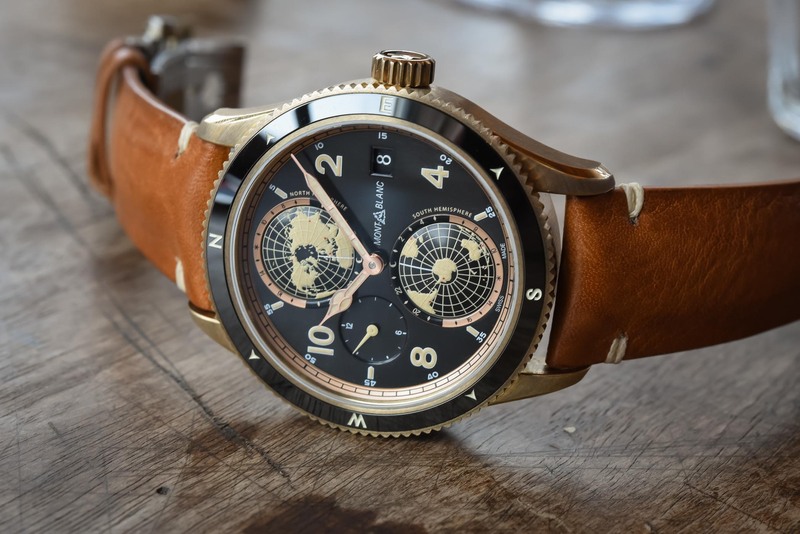 The main attraction of this watch is its unique display of all the time-zones around the world… and for once, not only for the northern hemisphere, as we see too often, but of both sides of our planet. To achieve that, the 1858 Geosphere features two turning domed hemisphere globes, which make a full rotation in 24 hours. The northern hemisphere at 12 turns anti-clockwise, while the southern hemisphere at 6 turns clockwise. They are both surrounded by a scale with the 24 time zones, along with a day/night indication in contrasting colours. The longitude reference meridian for both hemispheres is highlighted with a white line coated with luminous paint. 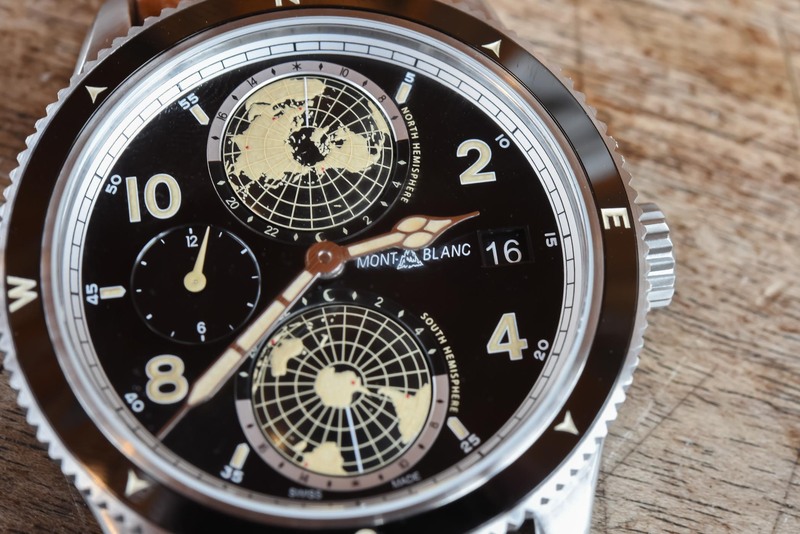 In addition to this dual-hemisphere WorldTime complication, the Montblanc 1858 Geosphere a provides a second time zone display located at 9, as well as a date (linked to the local time) indicated in an aperture at 3. 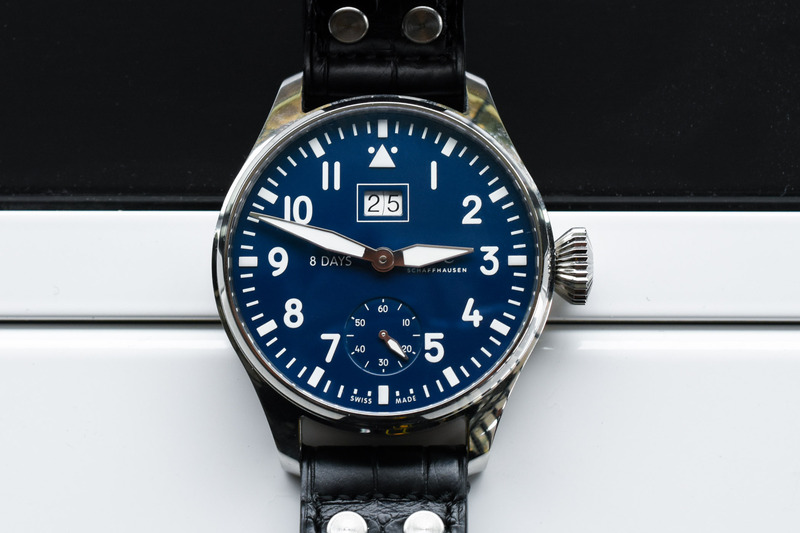 A rather complete watch overall, which of course indicates the time… Luminous paint has also been applied to the continents for increased visibility and performance at night, together with the large hands. 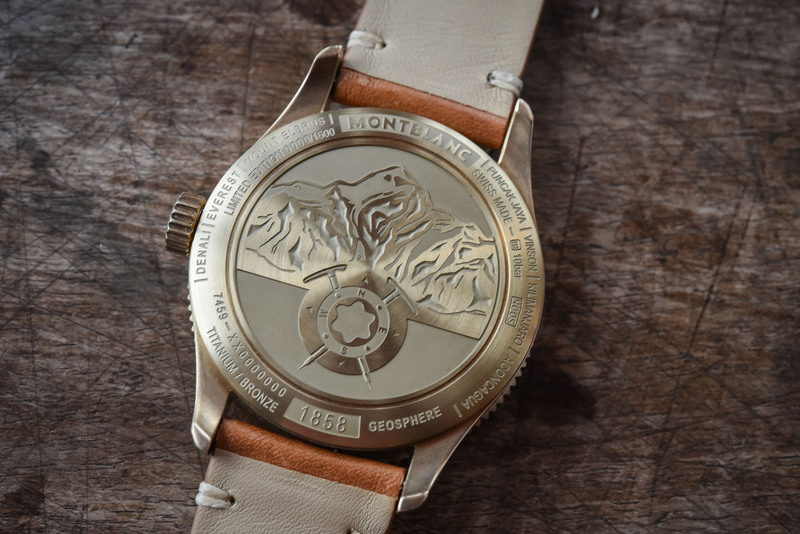 One small surprising detail: the world’s Seven summits are marked on the globes with red dots, enhancing the spirit of mountain exploration – the focus of the 1858 collection this year. 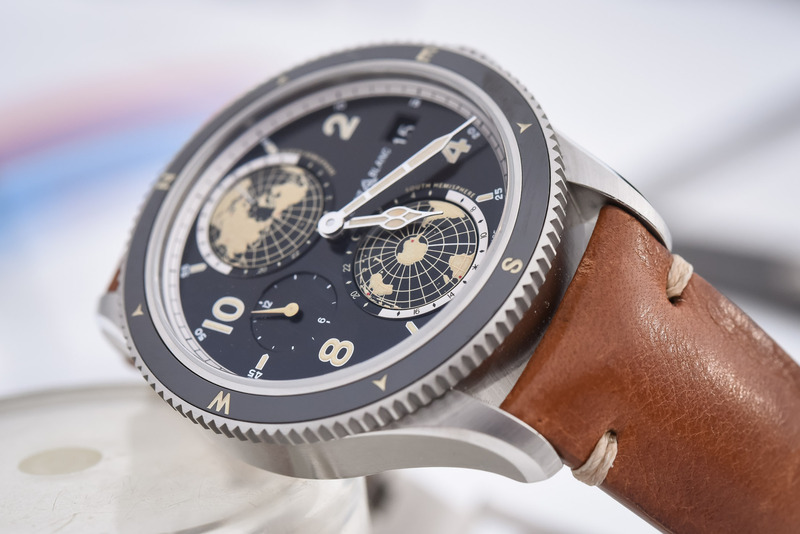 In terms of design, the Montblanc 1858 Geosphere integrates all the codes we’ve already seen on previous 1858 watches, meaning a strong Minerva inspiration. 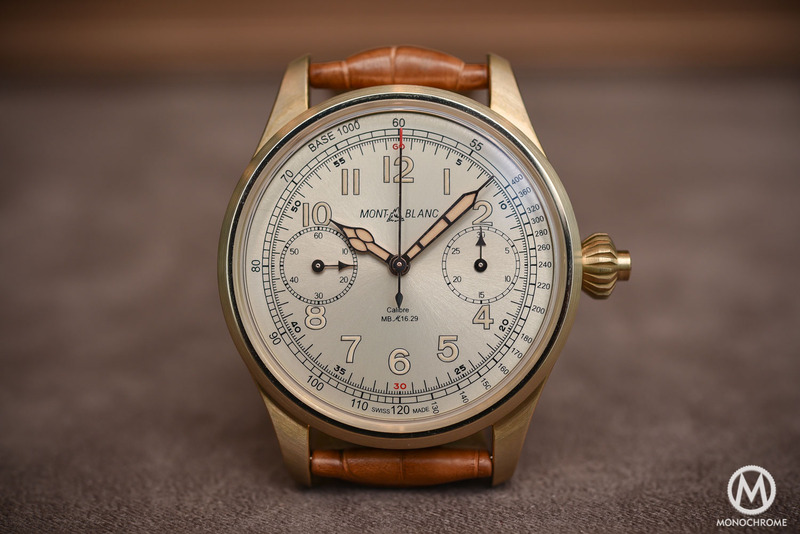 Based on military watches from the 1930s, including beige luminescent Arabic numerals and indexes, the historical Montblanc logo from the 1930s, domed and resized cathedral-shaped hands, as well as a railway track for the minutes. Yet, if the vintage inspiration is clear, the overall design remains modern and sporty, thanks to glossy elements – dial and ceramic bezel – and the addition of this complex display. An interesting mix of technical solutions and antique design. 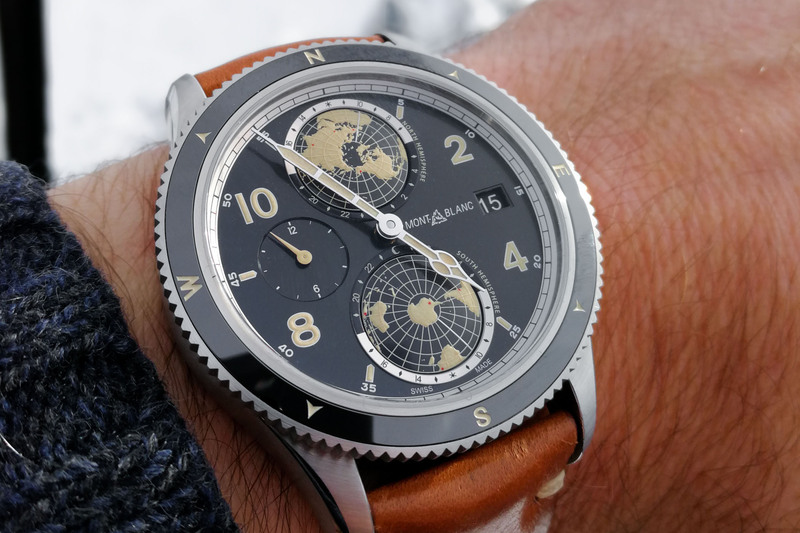 The case of the Montblanc 1858 Geosphere, despite the presence of a bi-directional bezel and the need for some space on the dial, remains perfectly wearable at 42mm. The finishing is pleasant, with a combination of brushed surfaces and polished accents. Lugs are shorts and curved and the slightly bulky case makes this watch sporty, but not a true tool-ish sports watch either. 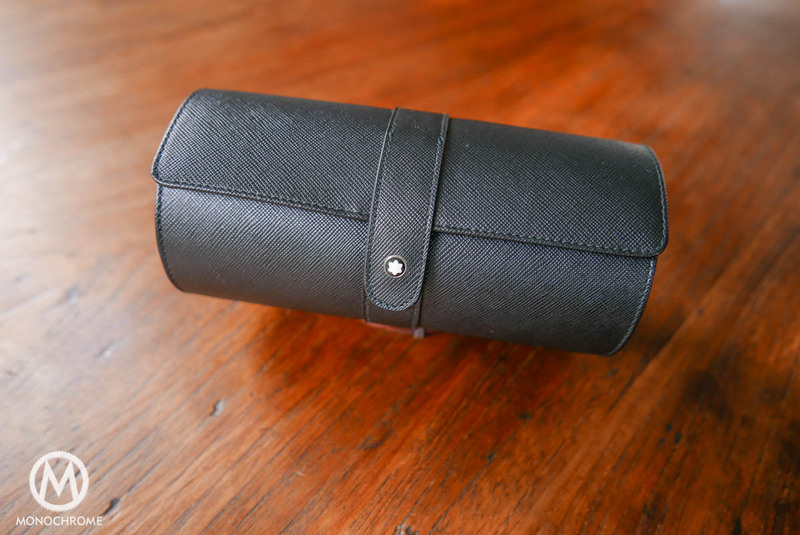 It makes a nice “adventurer” piece, something enhanced by the choice of materials – straps and case. Two versions of the 1858 Geosphere will be available. The first one, classical, is presented in steel. 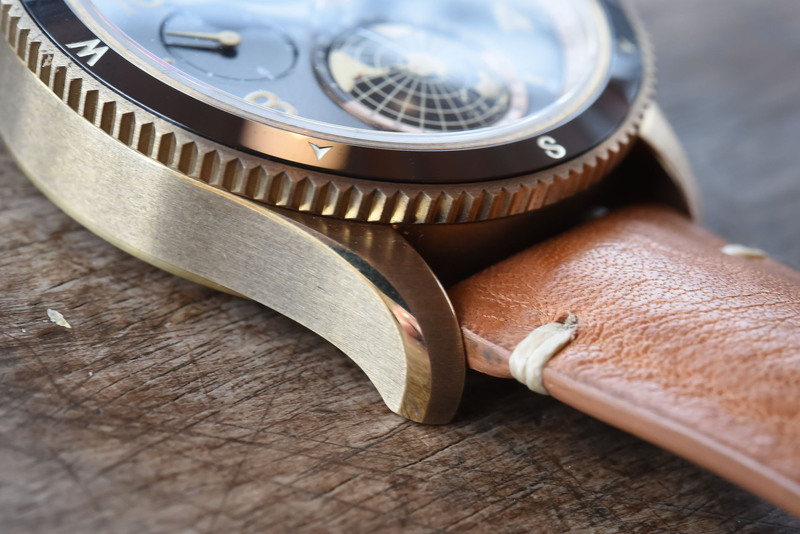 The second one, more original and in fact completely relevant with the adventure theme, is made of bronze, with additional elements (hands and dial accents) in rose gold. Even more surprising (and pleasant) is the choice of strap. 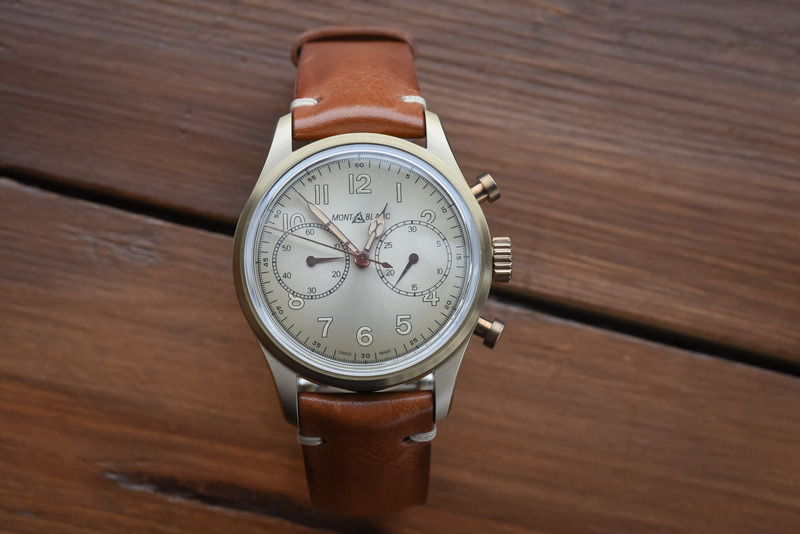 While shown here on a cognac-coloured aged calfskin strap with beige stitching, it will also be available with a brown Sfumato aged calf leather “Bund” strap (we’ll show it to you later). 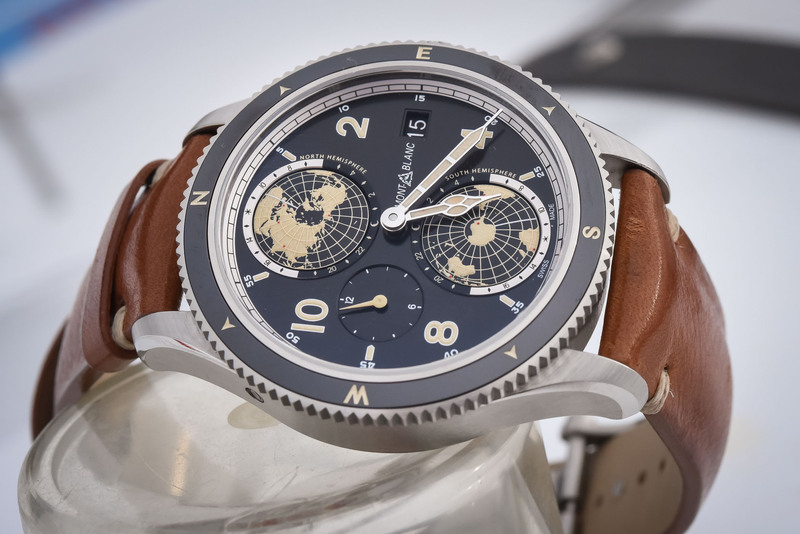 The Montblanc 1858 Geosphere is powered by an automatic movement (Sellita base), certified by the Montblanc Laboratory Test 500 and with an in-house WorldTime module. The steel version will make its debut as a non-limited edition, however, the Bronze edition will be produced in 1,858 pieces only. Price to be confirmed during the SIHH. More details on montblanc.com. I love the look of this watch. GMT complications are my thing, when it comes to automatics, and this one definitely doesn’t disappoint. Thanks for the amazing pictures! is there an am/pm indicator for the second timezone, since it is not displayed in a 24h format? Unfortunately there isn’t one linked to the small sub-dial, however the two hemispheres are displayed on 24h with day/night difference being enlightened. is there any true compass value to the bezel? or is it just for show. sorry for the novice question, but I didn’t see any article address it…so I’m guessing not? If so, thought, why would the bezel even be moveable in both directions?